1. [S29] Jess Land Records: Bk E p 126. 1. [S147] Ernstbarger-Friend, Somerset co PA.
1. [S220] Unknown name of person Book, unknown repository, unknown repository address. 1. [S25] 1820 Cen , Jessamine co Ky.
2. [S26] 1830 Cen , Jessamine co KY.
1. [S64] Dr.W.W. Houser, Gen of Houser/Rhoher,etc , p 207. 3. [S64] Dr.W.W. Houser, Gen of Houser/Rhoher,etc , p 207. Marriage*: He married Alice Katherine Gabbitt in Tn in 1892. 3. [S338] Census, unknown repository address, St Clair county, E. St. Louis Ward, Illinois. 4. [S367] Memphis, TN Library Online, online unknown url, Public Library Online Database. 5. [S338] Census, unknown repository address, St. Clair Co, E. St. Louis Ward 1, District 91, Illinois. She was the daughter of Edwin or Edward Gabbitt and Catherine Frawley. Marriage*: She married Harry Herbert Johnston in Tn in 1892. 1. [S338] Census, unknown repository address, St. Clair co, Illiinois E. St. Louis Ward 1 dist 91. 2. [S367] Memphis, TN Library Online, online unknown url, Memphis Public Library online database. 3. [S338] Census, unknown repository address, St. Clair Co, E. St. Louis Ward 1, District 91, Illinois. Birth*: Edwin or Edward Gabbitt was born circa 1833 in Ireland. Marriage*: He married Catherine Frawley circa 1857. 1. [S98] 1860 unknown record type, unknown repository address, Gillespie, Macoupin co, Il. 2. [S98] 1860 unknown record type, unknown repository address, Illinois, Macoupin county. Birth*: Catherine Frawley was born circa 1835 in NY. Marriage*: She married Edwin or Edward Gabbitt circa 1857. Birth*: Hiram E. Peck was born on 7 October 1832 in Westport, Ct. He was the son of Dennis H Peck and Phebe Hodge. Marriage*: He married Adeline Pratt in Evanston, Cook, Il, on 5 November 1855. 1. [S241] Census, unknown repository address, New Haven city, New Haven co, Ct.
2. 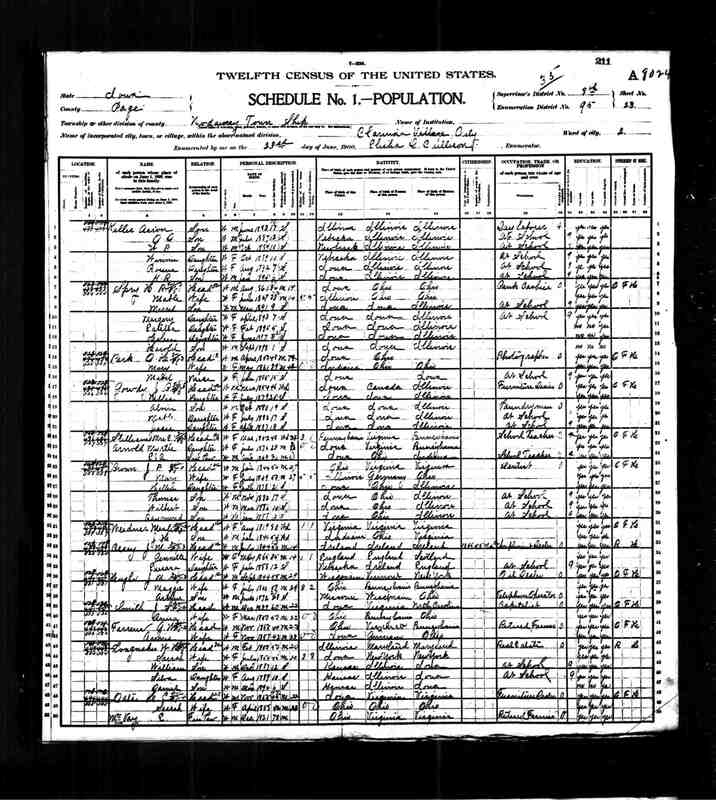 [S333] 6 July 1860 Ancestry census extraction, unknown repository address, age 27 years, 6th Ward Chicago, Cook co, IL. 3. [S94] Unknown, Bios Wapello co, IA , p310. 4. [S281] Film, unknown repository address, Center twp, Wapello county, Iowa. 5. [S338] Census, unknown repository address, Center twp, Wapello co, IA. 6. [S342] Film, unknown repository address, Center twp, Wapello co, IA. 7. [S343] 1920 unknown record type, unknown repository address. 8. [S73] Douglass Family, Family Bible. Birth*: Adeline Pratt was born circa 1838 in Vt.
She was the daughter of Paul Pratt and Caroline Adams. Married Name: As of 5 November 1855,her married name was Peck. Marriage*: She married Hiram E. Peck in Evanston, Cook, Il, on 5 November 1855. Death*: Adeline Pratt died on 6 March 1897 in Wapello, Ia. 1. Raised by her mother and step-father Capt Josiah Hastings of West. Hastings 1st wife was a sister of 2nd wife, Susannah Flagg. 1. [S228] PA Bureau of Land Records: Warrant #124, unknown repository. 1. [S230] Wise, James E. Obit, 13 June 1904. 3. [S51] Newspaper, online http://iagenweb.org/page/, O650. Julia Ann Priddy was the daughter of William Priddy and Diana Priddy. Marriage*: She married Thomas Wesley Wise in Jackson, WV, on 20 August 1866. Married Name: As of 20 August 1866,her married name was Wise. 1. [S232] Jackson co, WV (published), p 26. Marriage*: He married Diana Priddy circa 1845. Marriage*: She married William Priddy circa 1845. He was the son of Thomas Wesley Wise and Julia Ann Priddy. 1. [S51] Newspaper, online http://iagenweb.org/page/, M130. 2. [S281] Film, unknown repository address. 3. [S359] Page co, IA GenWeb, online http://ftp.rootsweb.com/pub/usgenweb/ia/page/vitals/m1-bride.txt. 1. Extract of records indicates year of death as 1878, however, I believe this is an error in reading the cemetery stone. Should be 1879. 2. [S231] Mrs. Robert E Hicks, North Grove. 1. [S51] Newspaper, online http://iagenweb.org/page/, L652. 2. [S357] Military Veterans Page co, online http://merrilskinner.home.mchsi.com/alphal.html. 3. [S51] Newspaper, online http://iagenweb.org/page/. 4. [S314] 1870 Ancestry census extraction, unknown repository address, age 7 years. 5. [S281] Film, unknown repository address, Page co, IA. 6. [S338] Census, unknown repository address, Nodawa, Page co, IA. 3. [S103] 1880, US Census, AL. 4. [S338] Census, unknown repository address. Occupation*: He was (an unknown value) in 1870 in Dentist. 4. 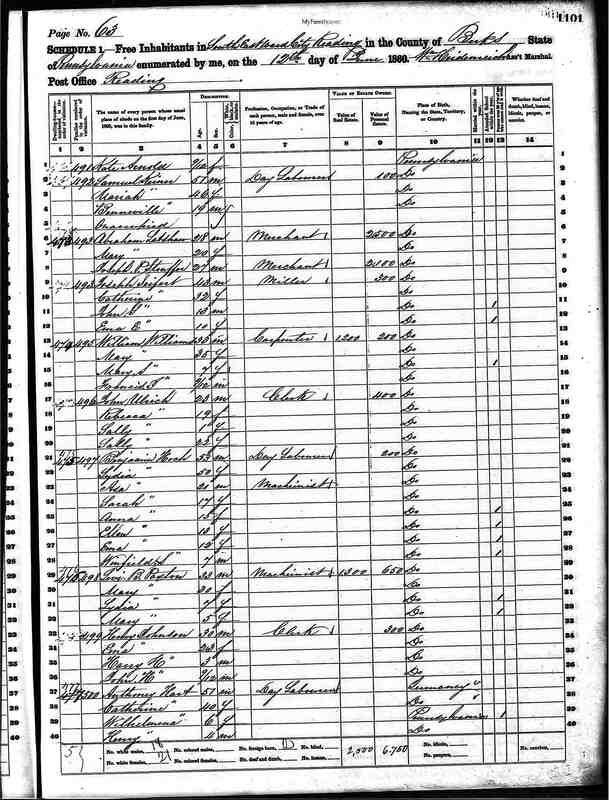 [S103] 1880, US Census, AL. He was the son of Stephen Bolender and Margareta Shinkle. 1. [S233] Unknown author, Shinkle Gen.
3. [S235] Unknown author, Clermont County, Il History. Marriage*: He married Mary Ann Barrett in Clermont, Oh, on 23 November 1835. Marriage*: He married Barbara Timmens circa 1856. 1. Seven other children, 3 died young, all unmarried. 2. [S233] Unknown author, Shinkle Gen.
Married Name: Her married name was Bolender. Marriage*: She married Jacob Bolender in Clermont, Oh, on 23 November 1835. Marriage*: She married Jacob Bolender circa 1856. Married Name: As of circa 1856,her married name was Bolender. Marriage*: He married Catharine Shinkle in Brown, Oh, on 12 November 1835. Marriage*: She married Jonas Bolender in Brown, Oh, on 12 November 1835. Married Name: As of 12 November 1835,her married name was Bolender. Married Name: As of 1843,her married name was Sterling. Marriage*: She married John Sterling in 1843. Marriage*: He married Elizabeth Bolender in 1843. Marriage*: He married Mary E Coleman in April 1855. Death*: Lydia died in November 1854. Marriage*: She married Stephen Bolender in April 1855. Married Name: As of April 1855,her married name was Bolender. Married Name: As of 1861,her married name was Bordner. Marriage*: She married George Bordner in 1861. Marriage*: He married Mary (Polly Ann) Bolender in 1854. Marriage*: He married Catherine Bolender in 1861. Married Name: As of 1877,her married name was Davis. Marriage*: She married Perrin Davis in 1877. Marriage*: He married Rebecca Bolender in 1877.